Anthony is wearing: Zara blazer, ASOS chinos, belt from a random market, ASOS shoes, Cotton On t-shirt and random sunnies. When styling Kayne, I drew inspiration from Anthony. This got him a little pissy and in need of a photoshoot (aka ATTENTION) to reclaim his Bam It's Joanne prominence. This is Anthony's signature style: a simple casual tee shirt, throw on a blazer, some chinos and a pair of nice shoes, and he's ready for a nice night out. I learned a lot about men's fashion just from observing his wardrobe and how he puts things together. I've learned so much from Anthony and I realized that it's simple, really. I'll break it down for you guys out there who are looking to revamp your (or your man's) wardrobes. There are 3 basic components: Blazers (sweaters are casual and cool, but you can never be overdressed or underdressed in a blazer), T-shirts and Chinos. STEP 1: Keep the T-shirt simple. White or grey (never black) are great as a base as they provide the perfect backing to nearly every colour. To start off, hold the T-shirt component as a constant (i.e just wear a simple white tee or grey, because these go with everything) and experiment with colour pairings between blazers and chinos. STEP 2: Anthony's secret to standing out is to CONTRAST. 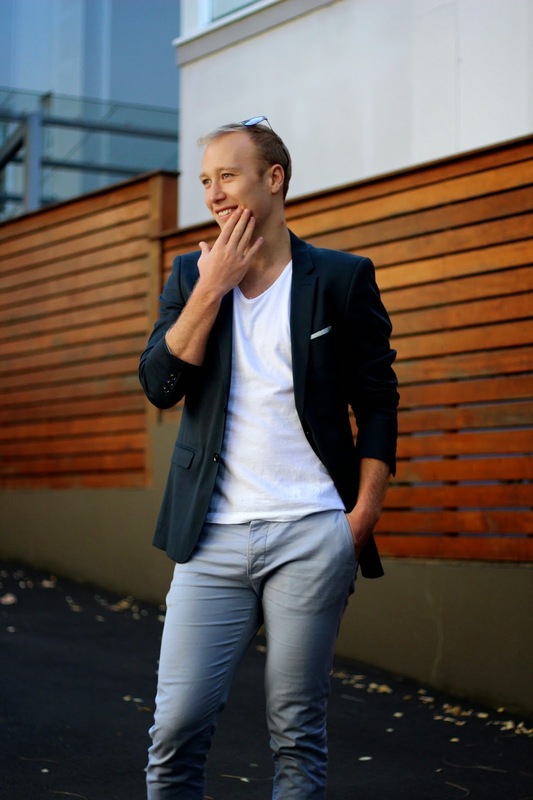 Bring colour and wow factor with chinos or the blazer. Decide on your blazer and the rest of the outfit will flow from here. 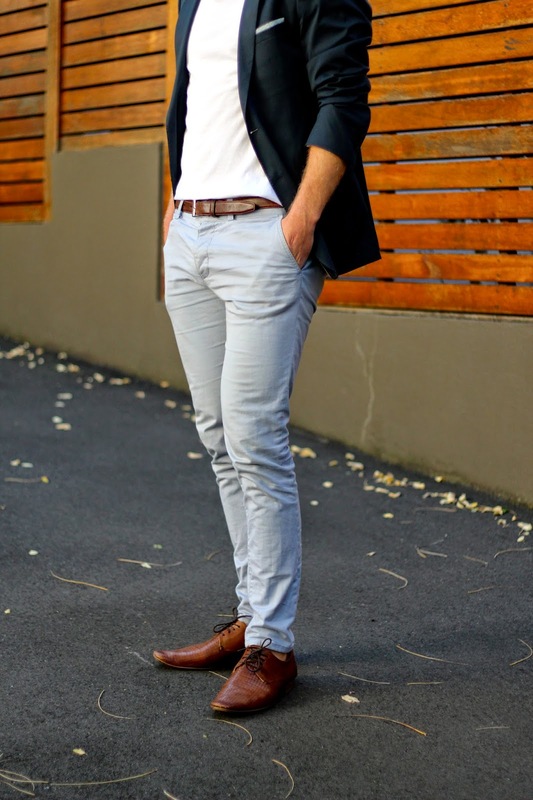 STEP 3: Chinos, pair your dark blazers (dark grey, navy) with lighter coloured pants such as light grey, stone (beige), pale blue, etc. If you currently own dark-coloured chinos, try a lighter pairing such as a chambray or a beige linen blazer for that fashion-forward look. STEP 4: When it comes to shoes and belts, match them with the pants and the blazer will just work. Wear black at own risk. In an informal setting black can come across too strong, whereas brown is always safe & stylish. For a bit of fun, mix up the texture of the shoe (these had a basket weave), or go for suede when you are feeling adventurous. STEP 5: Rock it with confidence. At the end of the day though, fashion is all about experimenting and lots of fun. Mix and match with what you have, and you'll be surprised with what you come up with. Feel free to ask me questions in the comment section below.